Christmas time – what a perfect occasion to tell the story of Jesus' birth. Most children want to enjoy the many traditional customs that come around this time of year, such as decorating the Christmas tree, watching holiday movies, and even giving/opening presents. A Very Merry Christmas Prayer is a children's book that shows the many fun activities of the holiday, but at the same time still reminds little ones about the true meaning of the season. Following bestselling titles A Pumpkin Prayer and An Easter Prayer, celebrate Christ’s birth with the new release A Very Merry Christmas Prayer. Enjoy the wonder of Christmas with a thankful heart. These little woodland animals are full of joy over so many blessings, from twinkling lights and sparkling snowflakes to family fun and the gift of God’s love. Join the celebration with gratitude and make this your own very merry Christmas prayer! When I received A Very Merry Christmas Prayer, the first thing that stuck out for me was the beautiful design of the book. On the cover is a Christmas tree and the whole right side of the book is cut out to match the shape of the branches. There's also a glittery overlay on the tree's garland and snowflakes. I thought these two aspects were pretty neat and definitely added to the Christmas theme of the book. Of course, I can't forget to mention the lovely illustrations by Natalia Moore, showing whimsical woodland creatures as they take a part in the season's festivities such as caroling, ice skating, and making snow angels. My son really enjoys looking at all of the wonders of this book. Jesus will always be the reason for the season. I'll continue to teach my little one that Christmas is a time to celebrate our Lord's birth. This is first and foremost. During the season, of course, we also like to enjoy the practical things like decorating the tree, making cookies, and listening to holiday tunes. As we step into the season, it's nice to take a look at all of these things that make Christmas time a lot of fun, and realize that we have so much to be thankful for. That is one of the many things that I really like about this book. From strings of lights on the tree that shine like the Star of Bethlehem to yummy holiday baked treats that remind us that God brings joy throughout, A Very Merry Christmas Prayer compares the many worldly Christmas traditions that we all cherish, and connects them with God. 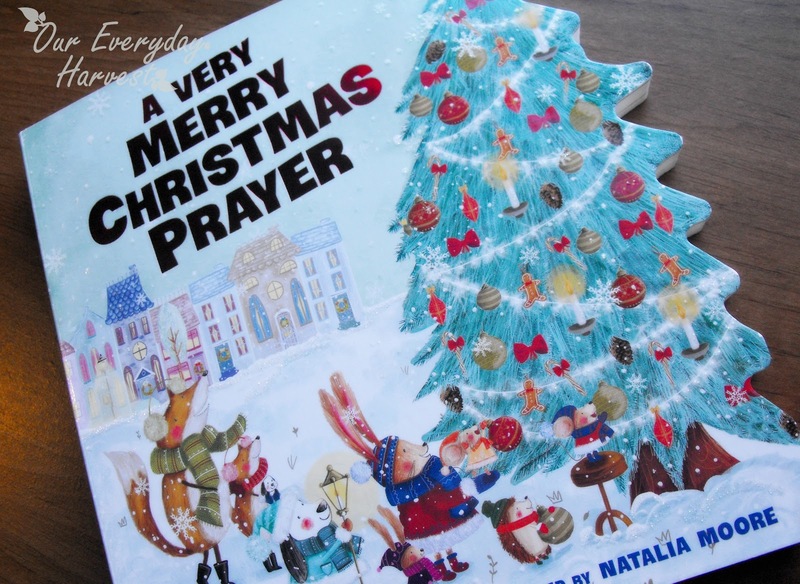 If you're looking for a children's book that encompasses all of the favorite pastimes of Christmas, but at the same time reminds little ones about the true meaning of the holiday, then A Very Merry Christmas Prayer is definitely one to get. Children will love the adorable illustrations and the meaningful message that it brings. I am so excited to also offer a chance to win a A Very Merry Christmas Prayer by Bonnie Rickner Jensen! One Our Everyday Harvest reader is going to receive a copy of this book, which is a true must in any child's library of holiday reads!